Home Diseases Are ringworms contagious? Ringworm of the beard is a contagious disease caused by a parasitic fungus, beginning with inflammation in and around the hair follicles of the beard. It is more persistent than either ringworm of the scalp or ringworm of the body, but fortunately it is not very common. It may be contracted in insanitary barbershops . Small, superficial nodules appear at first. Later these become larger and more deep-seated because the parasites work down to the bottom of the follicles. Inflammation is general over the skin of the affected areas, but more marked over the nodules, which have a tendency to occur in groups. Usually a brittle hair projects from the center or each nodule. It is loose and can be pulled out easily. The follicles may discharge thin pus. The disease causes considerable itching and discomfort, and it is sometimes mildly painful. A staphylococcal infection of the bearded area may closely resemble ringworm of the beard, except that the hairs do not loosen. It requires different treatment. Partly because of this fact, self-diagnosis is not easy, and self-treatment may not succeed, so in any suspected case of barber's itch a dermatologist should be consulted. usually scaly. It is uncommon in temperate climates. The patches are pea-size at first, but grow rapidly. They usually have a tendency to heal in the center, thus forming rings. The outer edges of the rings consist of tiny papules and a few small blisters. These are slightly elevated, causing the centers to look depressed. The rings may become as much as two inches (5 em.) broad. Sometimes they do not heal in the center, but continue as inflamed and more or less scaly patches. This disease causes no feeling of general illness and only a mild itching, but it is quite unsightly. It is frequently contracted through contact with infected domestic animals, especially cats. 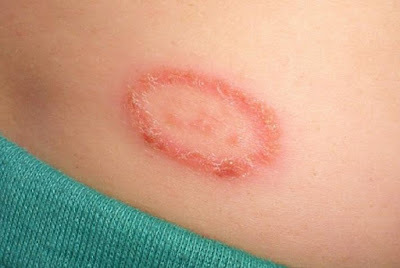 is considered as only another variety of ringworm of the body. In many cases the person with this condition also has athlete's foot the probable source of fungous infection which now affects the skin of the groin. Heat, moisture, profuse perspiration, and chafing by the clothing can prepare the way for the infection to take hold. It is more common and more trouble some in the tropics than in cooler climates. Mild itching or smarting sensations are the only forms of discomfort caused by it. It can be caused by one or more of the many kinds of fungi that cause ringworm of other kinds. In extreme cases, the nails degenerate into irregular masses of hard, crumbly material, with little or no resemblance to normal nails. Surgical removal of the diseased nails may be necessary for a cure. When the affected spots are numerous, they may grow together, forming large, irregular patches. The hair in these spots becomes dry, lusterless, and brittle, breaking off and leaving short stumps which can easily be pulled from the scalp. Baldness may occur, but it is not likely to be permanent. There tends to be a constant mild itching of the scalp. The disease is usually curable within a few months.